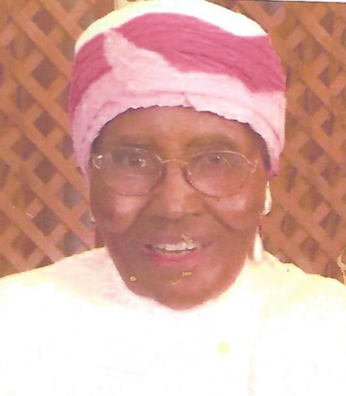 Queen Esther Muhammed was born: Queen Esther Faison on Sunday, April, 4, 10915, in Bullock County, Alabama to Father, George Birney and Mother, Lillian Ellis. She was reared by Mother and Stepfather Ocie Faison. She received all of her public school education here, before going up North to Chicago for better jobs and to experience "Big City Life"! From 1943-1977, she lived in Chicago and Momence, Illinois. It was there she joined the Nation of Islam under the Leadership of Honorable Elijah Muhammed in 1951. Queen Esther is preceeded in death by her parents; her one son, Herman Orr, who passed away at age 13; her husband Fred Thornton, who passed awasy in 1996; and her sister, Addie Ruth Youngblood. In 1977, she moved back to Union Springs, Alabama, purchased land, had a home built, joined with other local Muslims and began having weekly prayer and Islamic Studies in her home. She led in establishing a non-profit corporation, Masjif Al Islam, 501C-3, and helped establish "Sand Hill Islamic Cemetery" and "Jolly Recreational Park" & Pavilion. Her main goal has been to leave a place of worship, built with the name "Islam" on ti, for the wayfarer who might pass along her road. She expects for the property that she bequeathed tp be used for the purpose it is given. That is, to be developed Islamically. At the age of 81 years, she made the Haji Pilgrimage to the Ka-ba in Mecca, Saudi, Arabia- The 1st house built for the worship of the One G'D. This meant flying on an airplane for the first time in her life! She never mortaged her property, she designed and made her own modest attire to wear. She tried to do all of her shopping and business in Union Springs, Alabama!